A very simple recipe, because I am in the middle of moving house (summer 2007), and have been very busy. Where does the word lemonade come from? 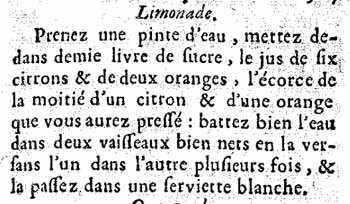 Lemonade comes from ‘lemon’ or the French ‘limon’. Another French word for lemon is citron, which is the English word for another fruit of the citrus family, the Citrus medica. 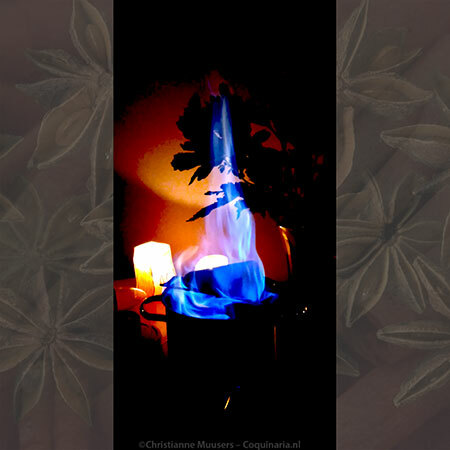 When carbonized water is used in the seventeenth-century recipe below instead of plain water, the result is something like modern soft drink. 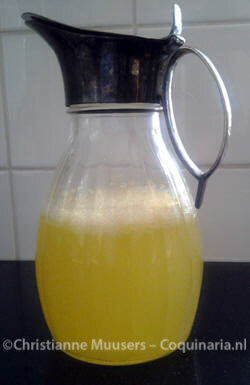 Fresh lemonade is easy to make, and citrus fruit is easily available now. But in the past citrus fruit were extremely expensive, and lemonade was something special, not just a drink for children. The recipe I used can be found in a seventeenth century French cookbook, in a chapter on digestives and mulled wines. 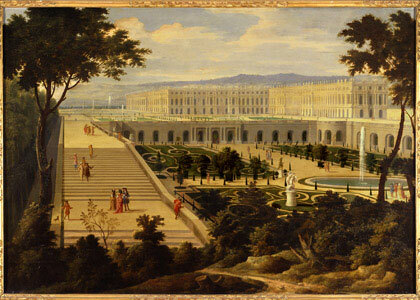 The picture above shows the Orangery of Versailles. Orangeries were named after the orange. They were the newest fad for the rich in the seventeenth century; greenhouses to let all kinds of exotic plants (like citrus trees) hibernate. In the summer the potted plants were wheeled outside to decorate the intricate formal gardens and serve as background for elaborate parties. The recipe can be found in Le Confiturier François (English edition by Scully p.494, see bibliography). The Confiturier was published anonymously 1660 (Scully p.106 note 155). There is only one impression, in 1667, that names La Varenne as author. According to Terence Scully it is by no means certain that La Varenne is the author, but at the very least he had inspired the person who wrote the Confiturier. 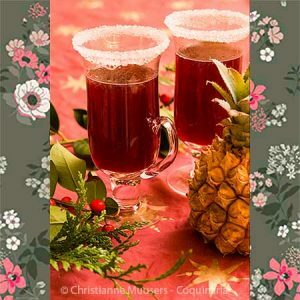 The full title of the Confiturier is: Le Confiturier François; ou La manière de faire toutes sortes de Confitures, Liqueurs, & Breuvages agreables. Two other cookbooks that are certainly written by La Varenne are Le cuisinier François (1651) and Le Patissier François (1653). Together, these three books have been translated into English by Scully. (more on François Pierre La Varenne). Get a pint of water and into it put half a pound of sugar, the juice of six lemons and two oranges, the peel of half a lemon and [half] an orange that you have pressed; blend the water well in two very clean vessels, pouring it back and forth several times from one into the other, and strain it through a white serviette. The difference with modern lemonade is that the fruit juice for the seventh-century version is ‘raw’, uncooked. Even the sugar is not dissolved in the water by cooking. And we regulate the acidity of modern lemonade and soft drinks by adding citric acid. Originally this was an organic acid from citrus fruit, but now it is mostly obtained from sugar with the use of certain moulds. Its function is, apart from improving flavour, prolonging the shelf life of the products in which it is used. When I made this limonadewith the original amounts (4 dl/1.75 cup fruit juice, 6 dl/2.5 cup water or sparkling water and half a pound of sugar), the lemonade was too sweet for me. So in my adaptation I use a lot more water and I have also added citric acid. The resulting lemonade is refreshing and fruity, but still sweet enough. For 2 liters; preparation in advance 5 minutes; preparation 20 minutes. Pour boiling water over one lemon and one orange, to melt the layer of wax (this applies also to organic fruit). Grate the peel of half the lemon and half the orange (or of the whole orange, La Varenne is unclear). Squeeze the citrus fruit, be careful with the peeled lemon and orange (or grate them after squeezing). Add water, sugar and peel. Instead of pouring the mixture from one vessel into another, you can also pour it in a shaker and shake. Pour the lemonade through a cloth or paper towel. Keep refrigerated. 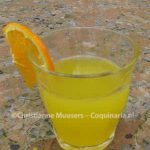 As an alternative, you can keep the fruit juice and peel, sugar and citric acid separately, and add (sparkling) water to a part of it just before serving. For 2 cups or a half litre water, use about 0.6 cup of the fruit juice-mixture. This mixture will keep for two days in the refrigerator, in a well closed container. There are many kinds of citrus fruit, but according to Harold McGee (On food and cooking) only three of those are the ancestors of all others, citron(Citrus medica) which is used for candied peel, mandarin (Citrus reticulata) and pummelo (Citrus grandis of maxima). But if I’m reading my sources Davidson and McGee correctly, there is a fourth ancestor, lime (Citrus aurantifolia). At least, I can’t find the combination of the three ‘arch-citruses’ that would have resulted in the mandarin. But lemons came into existence in two stadia: a hybrid of citron and lime then combined with pummelo. Harold McGee, On Food and Cooking: The Science And Lore Of The Kitchen. Revised edition 2004.